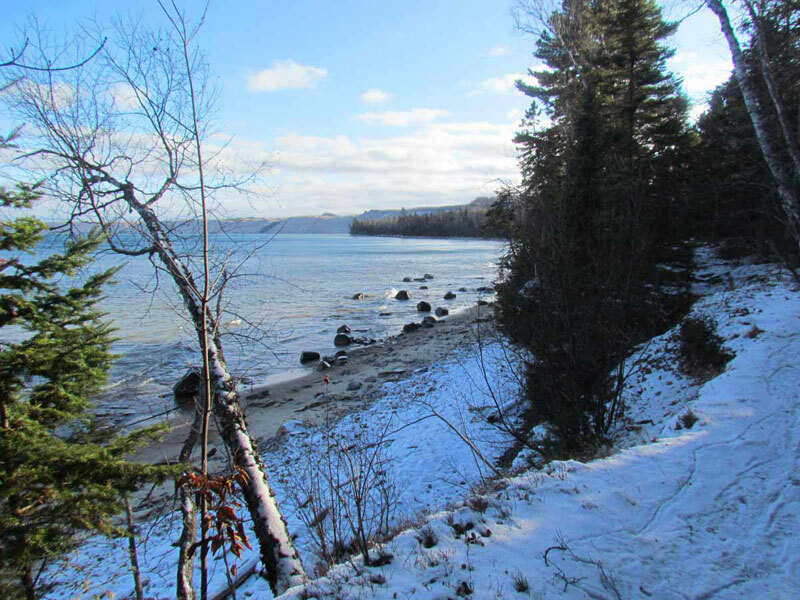 Winter has been slow to start up in the Grand Marais area. 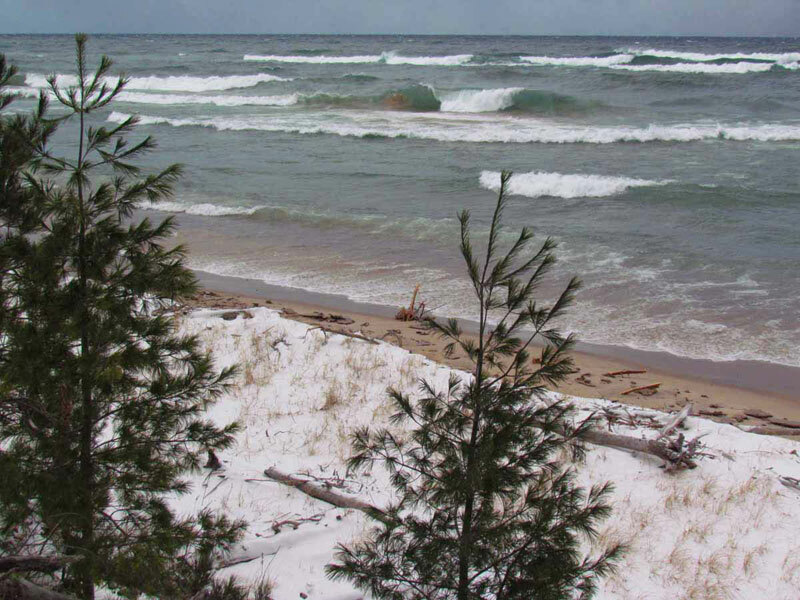 There are no official snow fall totals for Grand Marais, but there are for Marquette. We are down at least 30 inches of snow so far this winter. Only half of the ski runs are open at Marquette Mountain. Many of the snowmobile trails are barely usable – some are not. 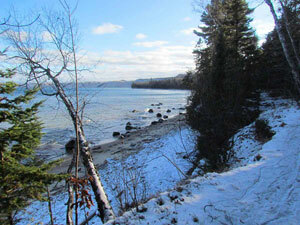 I cross country skied the Grand Marais trails today. Although they have been groomed, grass and twigs show through on the track. The lack of snow is not only a problem here, but throughout the country. Only 22 percent of the nation was covered by snow on January 4th. Compared to the last decade or so, it is the smallest area of snow cover. The second smallest total for this date was in 2007 at 27 percent of the country. 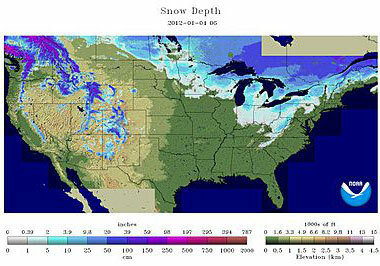 The national map showing snow cover as of January 4th is below. 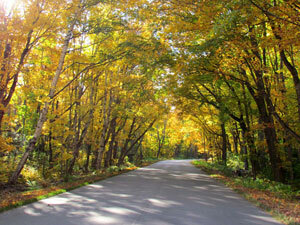 Since I have not executed a web page update for a while, I'll include some fall as well as a few early winter photos. If you would like to enjoy additional photos, please go to my photo journal blog at www.agatelady.blogspot.com. 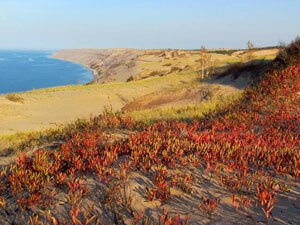 This first picture was taken from just east of the Log Slide (7 miles west of Grand Marais) in the Pictured Rocks National Lakeshore. 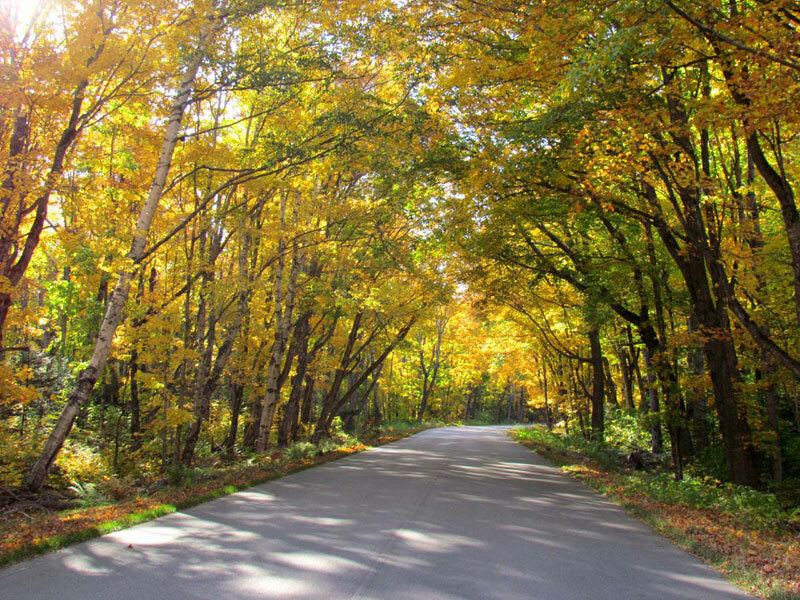 When they started paving H58 between Grand Marais and Munising, some locals were upset that we would loose the tree canopy covering the road. The section just west of Grand Marais was paved several years ago. The canopy has now recovered. This has been the year of wind. It seems like once a week or so we end up with a major wind event. 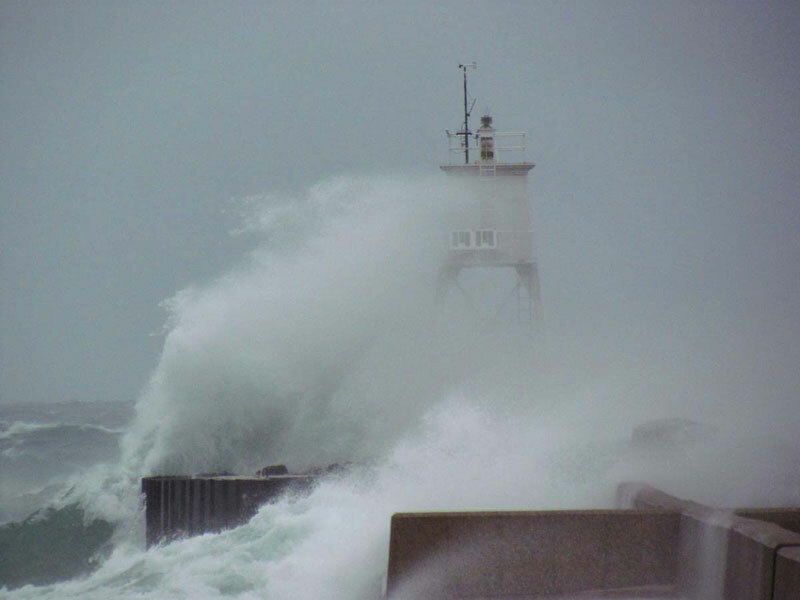 Here is a shot I took in October of the waves hitting the break wall and lighthouse in Grand Marais. 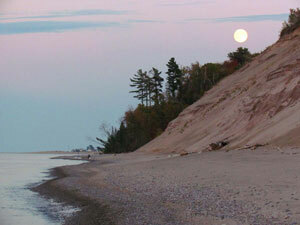 On one of the calmer fall days, I headed down the beach to see if I could capture the full moon. The adventure was a success. Although winter has not kicked in with its full power, I still have a few photos. Normally shots like these would have been taken in October. These were all taken in December and January. The first shot was taken from a beach located around six miles east of Grand Marais. 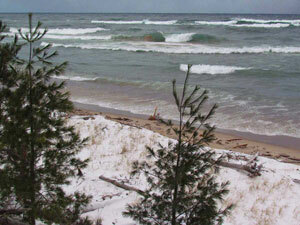 The picture below was taken when I was walking back from Au Sable Lighthouse to the Log Slide. 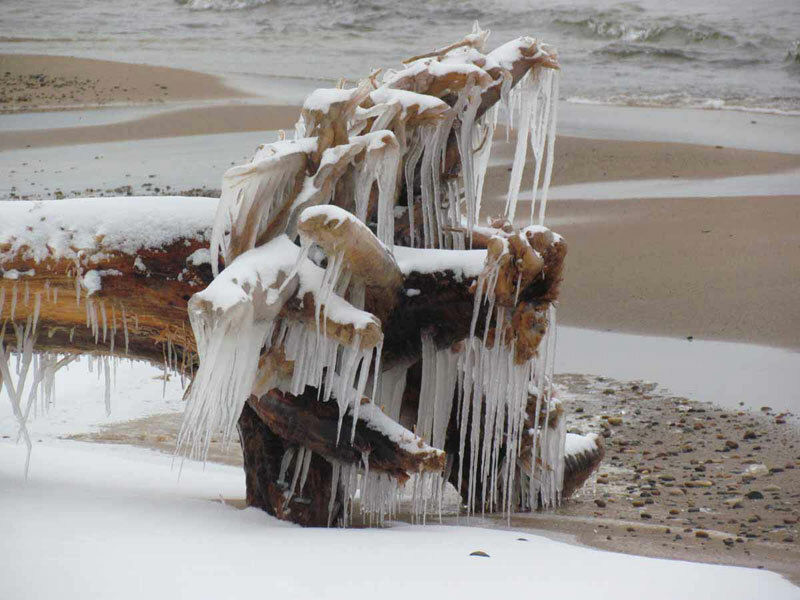 During the late fall the waves of Lake Superior throw the large trees scattered on the beach like they are toothpicks. Then, as the temperature drops, the water can freeze on the branches and roots making some artistic displays. 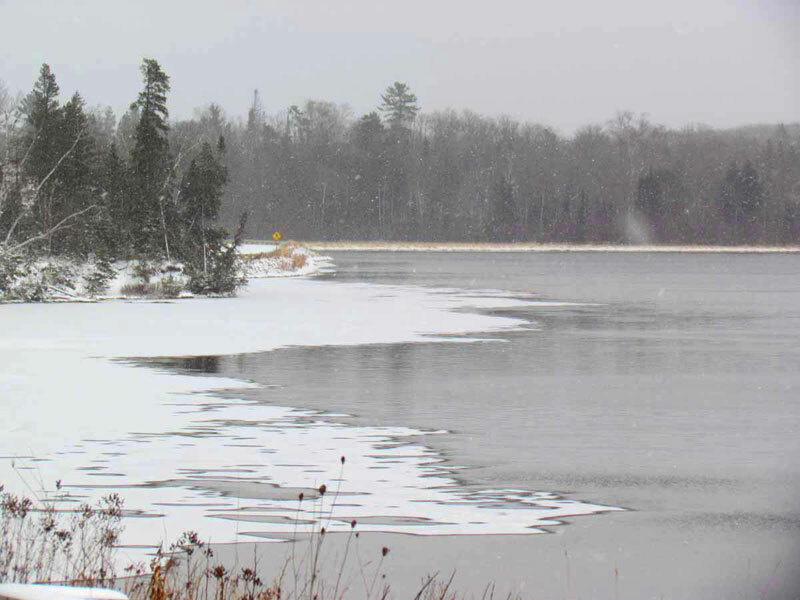 Sable Lake has frozen late this year. Here is a picture of the ice starting to form in late December.